I finally found the most natural and safe hairball gel for our cats. After a week of waking in the middle of the night to that oh so familiar sound of a cat getting up a fur ball, I said that is enough; my regular so called “Natural Hairball treats or gels was not working! Most all cats when they reach the ages of ten and above cannot digest the fur they accumulate after grooming. 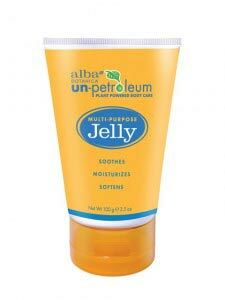 Alba UN Petroleum Jelly is SAFE (per Dr Anna Gardner) and you can use it for many other things; dry skin, eye makeup remover, prevent irritation, and many more. I take a small finger full about 1 inch, and place it at the back of the Caesar’s tongue, close his mouth and tilt it up while he swallows a few times. You can also put some on their paws or lace some with our chicken liver powder or other crushed treats they like. I also found that by simply combing your kitty with one of those flea combs twice a day (GENTLY) especially after the winter when they shed a lot more, works to eliminate a lot of extra fur they can ingest after grooming. Give once a day for serious hairball issues, otherwise three times a week. Buy at your local drug store or online at Amazon. Homemade raw meat cat food.